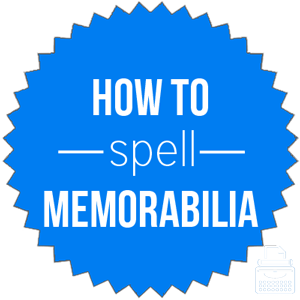 Spelling of Memorabilia: Memorabilia is spelled m-e-m-o-r-a-b-i-l-i-a. Definition of Memorabilia: Memorabilia are things that are worthy of remembrance, things that stir recollection, or are collected because of their association with a specific field or interest. One may collect photos, newspaper clippings, autographs, CDs, posters, etc., from a historical event or a performance, such as a World Series baseball game or band’s last concert. People commonly collect items over time from their own experience or work in a particular field to commemorate their career or passion. What does memorabilia mean? Memorabilia can be a singular or plural noun. Memorabilia refers to items or materials that are collected and kept because they are connected to a particular person, historical event, field, culture, interest, etc. Inside the box of memorabilia were photographs and newspaper clippings from the band’s last concert. There is a display of World War II memorabilia at the local museum this weekend. Memorabilia also refers to objects that are unique and worthy of being remembered. He opened the book to reveal all the memorabilia she had collected from life in the theater. Since it was such a unique event, an assortment of items was collected and kept as memorabilia to commemorate it. The word memorabilia was first used in 1785, according to Merriam-Webster’s. The word memorabilia originates from the Latin word memorabilia, from the neuter plural of memorabilis, meaning memorable. Memorabilia is a noun. Memorabilia can include anything that is remarkable and worthy of remembrance.